Brothers William B. and Ambrose M. Parsons hired architects Thom & Wilson to design a row of 11 brownstone residences on East 81st Street between Fifth and Madison Avenues in 1883. The high-stooped, neo-Grec homes were completed the following year. No. 6, just steps from Central Park, was sold to wealthy meat packer Charles White. The family's new home was four stories tall above the English basement, and its openings were enhanced with distinctive architrave surrounds which included scrolled base supports, Eastlake-style carvings on the brackets and transom panels, and tiered cornices. Charles White died at the age of 78 on Friday, December 13, 1889. His funeral was held in the house three days later. By the turn of the century it appears that the White family was leasing the house; which had become home to William F. Wilson. He died on June 22, 1903 at the age of 66. In the meantime, vocal instructor Oscar Saenger and his family were living at No. 51 East 64th Street. Born in Brooklyn to German-American parents in 1868, he had studied at the National Conservatory of Music of America and in 1891 became the baritone soloist for the New American Opera Company in Philadelphia. The following year he married organist Nayan (known as Charlotte) Welles. Saenger gave up the stage to devote himself to coaching. His tutelage was just one segment of a student's education. And the proper training for a singing career was both time consuming and expensive. In 1910 he explained the process in The American History and Encyclopedia of Music. "Preparation for an operatic career involves a weekly outlay for at least two vocal lessons, two opera class rehearsals, two language lessons, either French, German or Italian, a lesson in stage deportment, one lesson in musical theory and the cost of an accompanist or coach for from four to six hours' private practice." He said "The pupil who provides wisely must count on spending $1,500 a year for at least two years, to cover the period of preparation." That would amount to about $38,600 a year today. Saenger's fees were, apparently, well worth the cost. The American History and Encyclopedia of Music called him "the wizard of vocal teachers, whose students are to-day the favorites at the great opera houses here and in Europe. Nothing more valuable than this master's treatment of his subject can be imagined." In May 1911 Saenger purchased No. 6 East 81st Street from Charles White's daughter, Georgianna, for $75,000 (just under $2 million today). By now the old brownstones in the Central Park neighborhood were decidedly out of style. One by one they were being razed or remodeled into modern residences. Within three months architects Marvin, Davis & Turton had drawn plans for updating the former White house. The renovations, which would cost $15,000, included rearranging the floorplans and replacing stairs on the interior. Outside, the stoop would be removed and the facade of the lowest two floors extended to the property line. Above the extension, the plans called for a third-floor "sleeping porch." Sleeping porches were important in the decades before air conditioning. Entire families would move bedding onto the porches to escape the suffocating heat of summer. But such a "porch" in the Saenger mansion would be highly unusual. Not only would it be on the front of the house (they were normally hidden in the rear); but it would be a rarity in such a high-end home. Few wealthy families required a sleeping porch because they closed their mansions and spent their summers in resorts like Newport or Bar Harbor. But the Saenger family obviously intended to use their house year-round. The architects were directed to transform the roof--normally disregarded by upscale families--to a garden and entertainment area. Oddly enough, what appears as an elegant, full-width balcony was termed a "sleeping porch" by the architects. The remake was somewhat surprising. The lower two floors, clad in light stone, were modernly neo-Classical. The entrance was now directly at sidewalk level and the second floor was dominated by three sets of handsome leaded glass French windows below transoms. They were protected by Adams-style wrought iron railings and separated by Ionic columns and pilasters. Directly above the hefty cornice at this level was the matching iron railing of the sleeping porch. Rather startlingly, the renovations stopped here. The stylish Edwardian transformation stopped short, giving way to the old 1884 facade. Earlier in 1911 Charlotte celebrated Oscar's birthday. On January 18, 1911 The Musical Courier reported "Mrs. Oscar Saenger gave a very unique entertainment on Sunday evening, January 8, to celebrate her husband's birthday. First a dinner served twelve old friends...then later in the evening other friends were bidden. A program consisting of a dramatic presentation written by their daughter was offered." It was a foreboding of things to come. Oscar Saenger's teaching studio was in the 81st Street house and the stream of operatic luminaries who came and went through its doors was impressive. Many of his students went one to illustrious careers, including Leon E. Rains, the leading basso of the Royal Opera of Dresden; Joseph Regneas (who was so indebted to his coach that his professional name was Saegner spelled backwards); Joseph S. Bernstein; Florence Hinkle; Riccardo Martin; Berenice de Pasquali; and, Metropolitan Opera star Marie Rappold. Marie Rappold quietly married Rudolf Berger of the Berlin Royal Opera Company (described by The New York Times as "the Kaiser's favorite tenor) on July 2, 1913. While friends anticipated a wedding on July 3, the groom "objected to a formal wedding" and the couple sneaked away to be married a day early. Instead of attending a wedding, the newlyweds' friends arrived at the Saenger house "where an informal reception in the gardens on the roof awaited the bride and bridegroom on their return from New Jersey," reported The Times. The soprano told reporters that the hurried affair caused at least one near disaster. In rushing to New Jersey, Berger had forgotten the ring. A friend, Rudolf Witrofsky of Berlin came to the rescue. "He was wearing a heavy gold band ring, and he suggested that I borrow the ring for the occasion," Marie explained. "It was a little large, but I took the ring, and then the man married us." 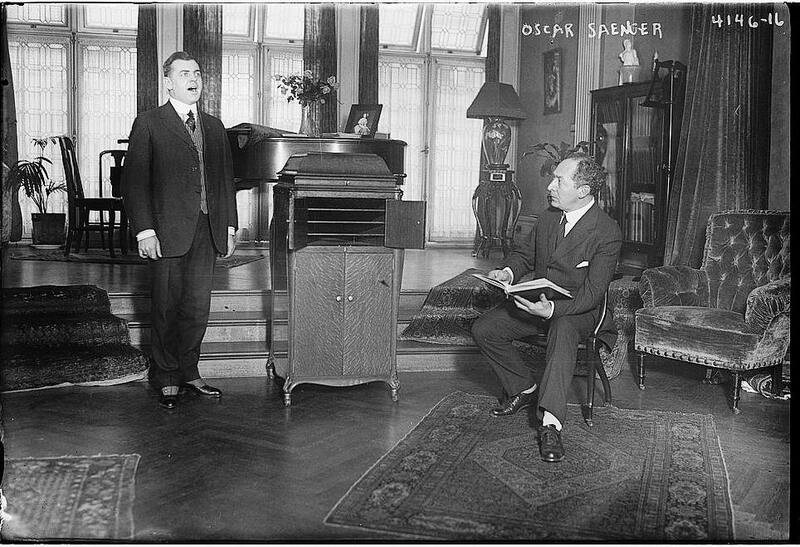 In 1916 Oscar Saenger devised an ingenious marketing scheme to teach vocal lessons to the masses. He teamed with the Victor Talking Machine Co. to produce a set of ten records, described as "a complete course in vocal training." A separate set was offered for Soprano, Mezzo-Soprano, Tenor, Baritone, and Bass. A Victrola advertisement noted "The Oscar Saenger Course in Vocal Training for any of the voices mentioned above, may be procured from any Victor dealer at $25--the cost of a one-hour lesson at the Saenger Studio in New York." In 1917 Oscar Saenger posed with his own Victrola player between him and a student in the second floor studio here. Note the small-paned leaded windows which survive. photo from the collection of the Library of Congress. The income from his private sessions and his Victor records was much needed. The Saengers' daughter, who had taken the professional name of Khyva St. Albans, still had dreams of being a famous playwright and actress. Oscar funded elaborate productions, none of which made his daughter a star. The Saengers had a houseguest in the form of Swami Paramahansa Yogananda who established his headquarters here for a some time. The mystic guri arrived from India in 1920 to introduce westerners to eastern meditation and philosophy. He attracted a following among the opera set, including tenor Vladimir Rosing, soprano Amelita Gali-Curci, and aspiring singer Clara Clemens Gabrilowitsch, daughter of Samuel Clemens. And, obviously, Oscar Saenger. Music lovers nationwide were most likely shocked when, a month after Saenger's death, the details of his estate were publicized. While the famous and beloved instructor had left generous bequests--like the $2,000 "equivalent of a year's salary, to 'my faithful secretary,' Lillian Suwalsky"--Khyva's dreams of acting fame had drained the family's finances. The New York Times reported "The estate of Oscar Saenger...may be too small to carry out bequests." It noted that Charlotte "may receive not more than $500." Charlotte and Khyva left East 81st Street, which was sold for unpaid taxes. Khyva never gave up; and eventually reinvented herself as an American born Russian ballerina with the name Zara Alexeyewa Khyva St. Albans. The Depression years were not kind to the former Saenger house and in 1935 it was repossessed by the Bank for Savings. It was vacant six years later when a builder purchased it "for remodeling into a ten-family house," according to The New York Times on October 20, 1941. The announcement placed the cost of renovations, resulting in two apartments per floor, at $25,000. Among the residents here in 1973 were 20-year old Linda Rubin and 35-year old Robert Antonelli. The pair joined a daring scheme in September that year when they and three others climbed a drain pipe and broke a window to the second floor apartment of Peter Salm at No. 9 East 68th Street. An heir to a Standard Oil Company fortune, Salm owned an impressive art collection. Salm was gone during the weekend of September 22 and 23; giving the burglars plenty of time. The heist, spurred by art dealer Jean Zimmerman, who owned the Gregoire Galleries on Madison Avenue, totaled 32 paintings. The crooks did not enjoy their spoils long. A week later police recovered seven of the paintings, valued at $200,000, and arrested all six persons involved. In 1998 the Saenger residence was reconverted to a single family home. The house with the colorful history and a split personality facade survives much as it looked when one of America's most notable operatic coaches made his mark on it in 1911. It was repossessed in 1935.